"One of Our Imps is Missing!" Ya know, we've dedicated so much time to celebrating Action Comics of late, that I think I've kinda neglected the other Superman books. 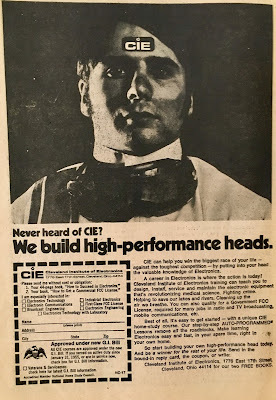 Just came across the one we're going to discuss today... sometimes that's just the ticket for the humble blog. Find a new and crazy book... and immediately cover it here. It keeps things "interesting"... at least for me. I mean, I couldn't have bet any amount of money that we'd be chatting up Chris Delbart, the Wolf of Wall Street today! 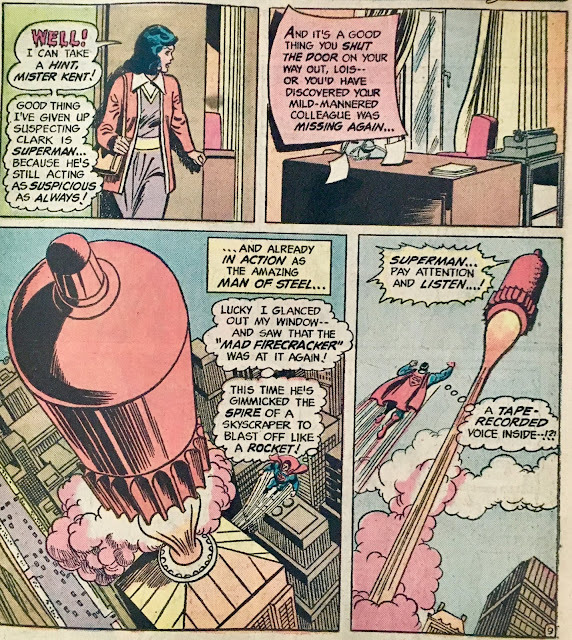 We open with Superman flying toward the penthouse of a Dr. Vandt who Lois Lane is currently interviewing. One quick-change later, and they are joined by Clark Kent. Our Dr. Vandt is either a NASA bigwig or just a big fan of space exploration... either way, he's irritated at the lack of funding the organization has received in recent years. After the interview ends, Lois and Clark take their leave. 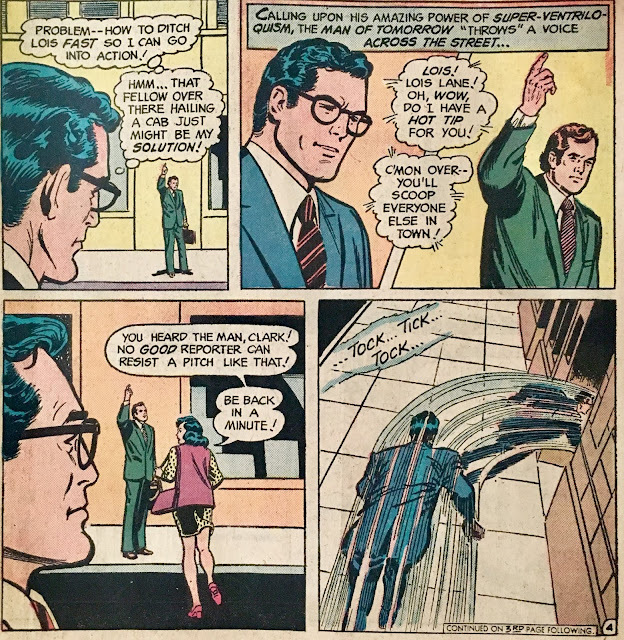 As they walk, Clark picks up the sound of a ticking bomb with his super-hearing... and so, he distracts Lois with some super-ventriloquism so he might get a closer look. Following his (super) ears brings him to the Rudd Aircraft Company... where the ticking seems to be coming from a stainless steel sculpture of a jet atop the building. He goes to whip himself around the jet in order to contain the explosion... and is shocked to find that it wasn't a bomb... but a fireworks display! 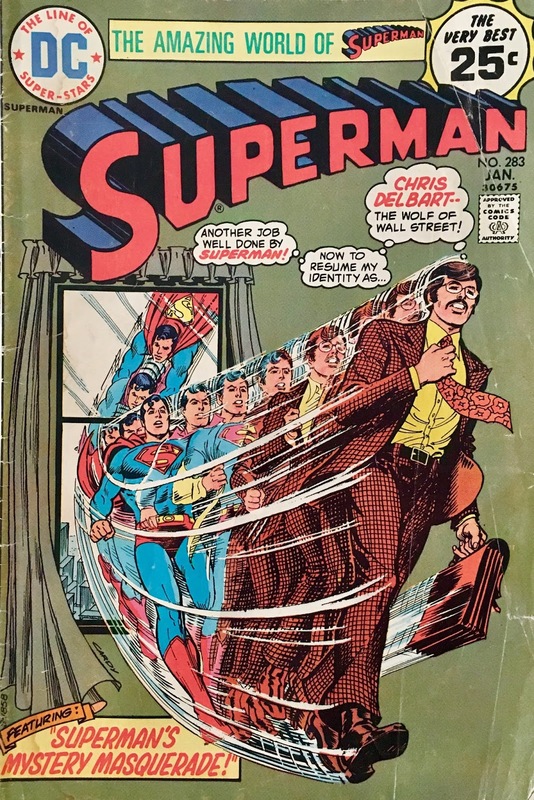 Worried that this might have been a trick in order to draw Superman into the open, he retires for the day... and into a brand-new alter-ego! Ladies and Gentleman, I give you... Chris Delbart, the Wolf of Wall Street! We watch "Chris" as he goes through his daily routine. The next morning, he's back to being Clark Kent... and is meeting with a very irritated Lois Lane. His disappearance the night before led to Steve Lombard filling in for him on the evening news. Lois storms out, and just then... another firecracker goes airborne. 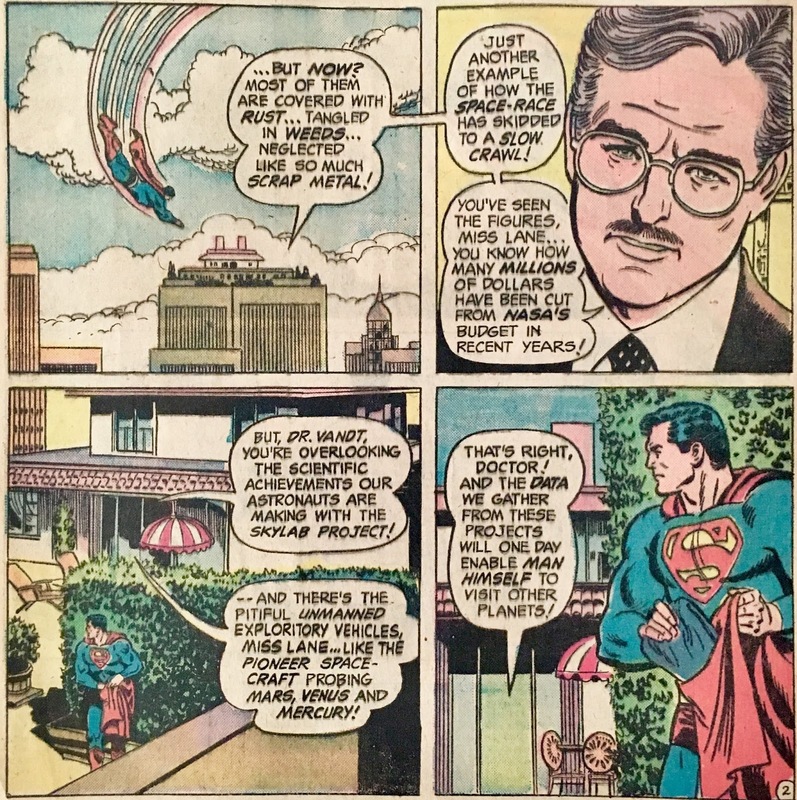 Clark "supes up" to check it out, and is surprised to find that this one has a message especially for him! ... well, sorta. He believes Superman is really Chris Delbart, the Wolf of Wall Street! 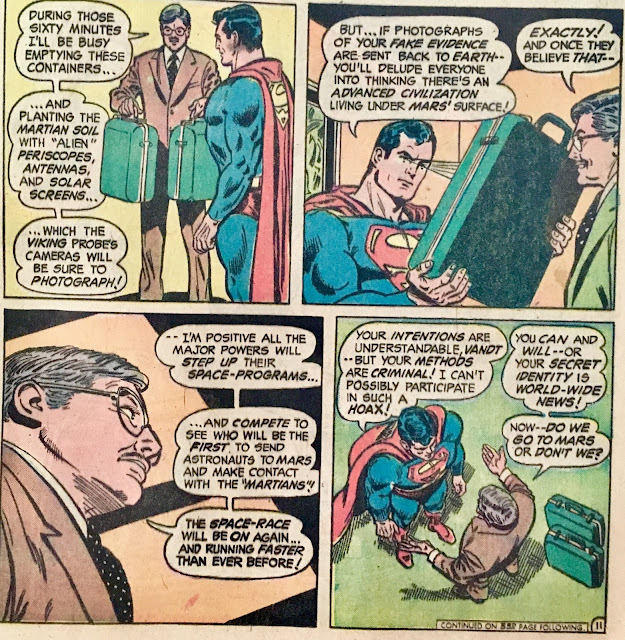 And with that knowledge, he plans to blackmail the man of steel to do some of his bidding. Ya see, he wants to take a trip to Mars, so that he might plant some "alien" evidence, in hopes of increasing NASA funding for space exploration. This is where I kinda have a disconnect... 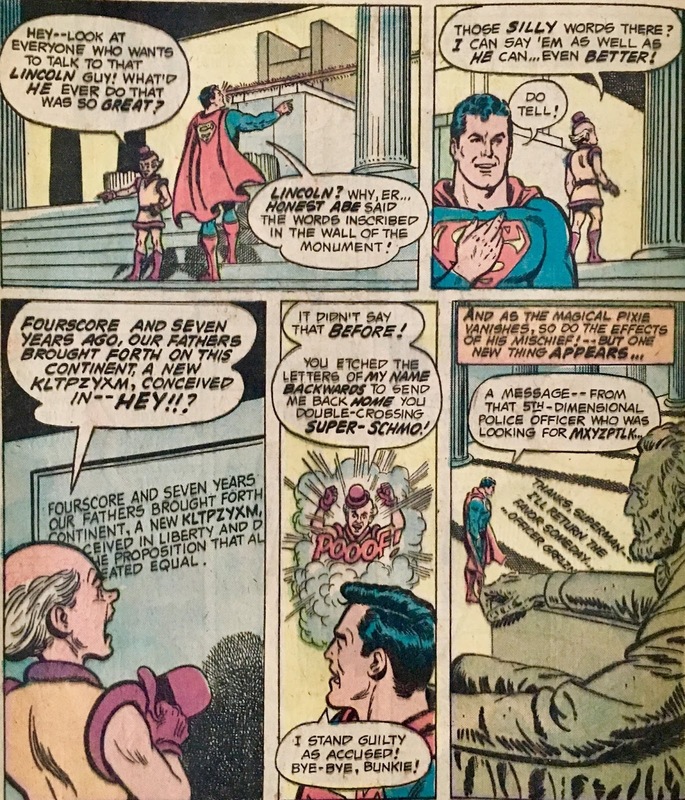 I mean, isn't one of Superman's pals a... Manhunter (from Mars)? I don't think it's lack of "belief" that's keeping the funds low there Doc! 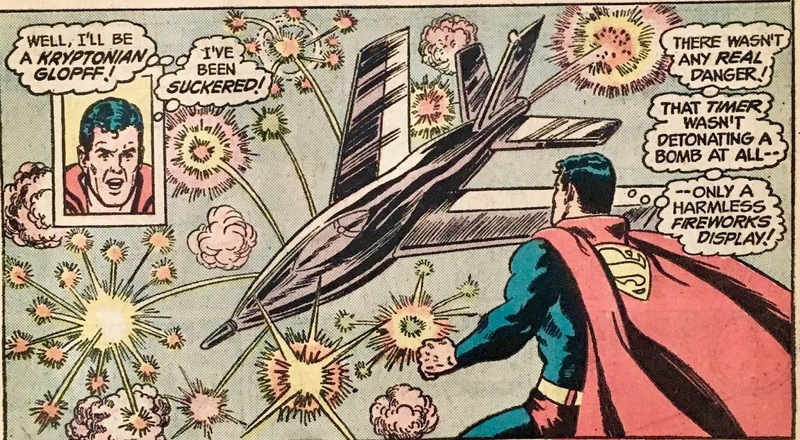 Well, Superman knows when he's beat... or, ya know, just wants to play along... and so, he agrees to take the Doc to Mars. He blindfolds him for the trip, so his eyes will be shielded from the Sun... and plops him down on Mars. 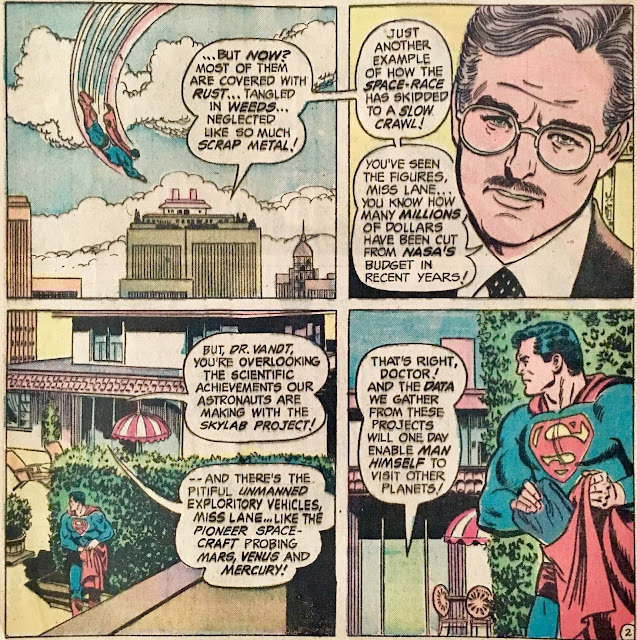 Superman tells the Doc that he's on his own... because it's unsafe to return him to Earth since he knows "the secret". Vandt is then attacked by a Martian Monster! He flees and winds up outside?! Well, ya see... he was never on Mars, this was just "Metropolis Mars Land", a soon-to-be amusement park. Wonk wonk. We wrap up with the big explanation. 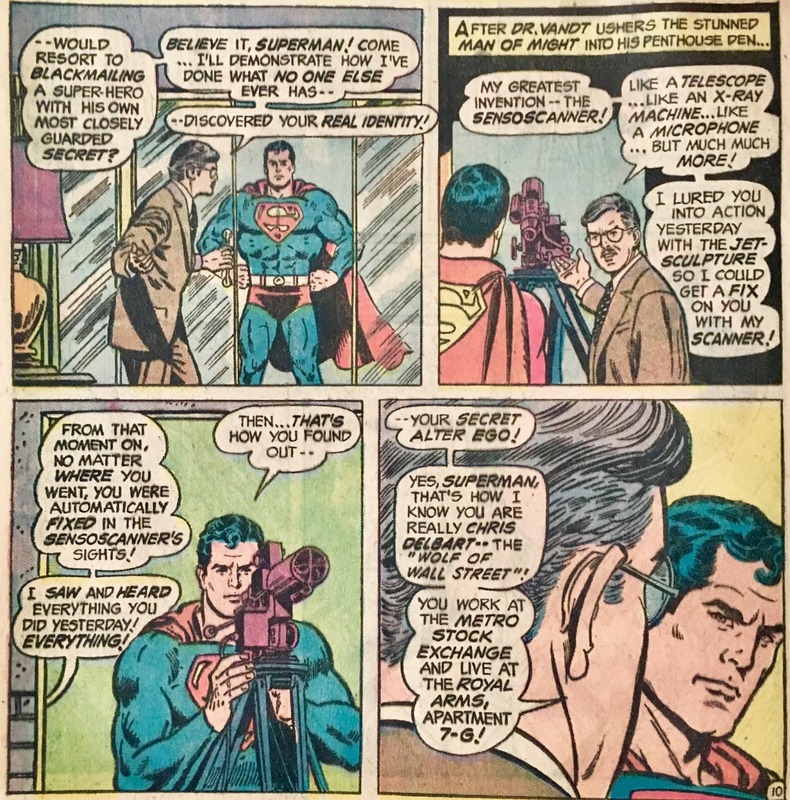 Superman had felt himself being scanned during the first fireworks display, and decided to throw whoever was trying to track him for a loop. 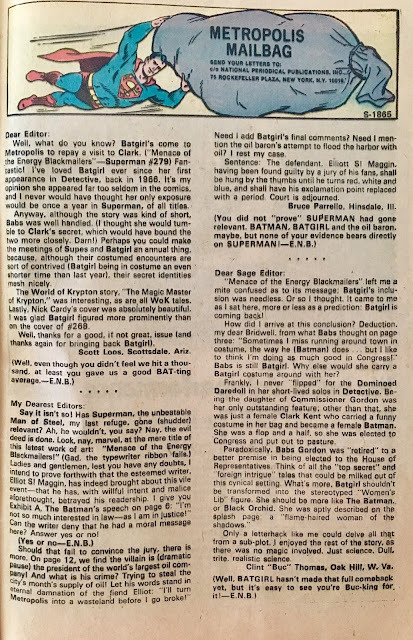 He took the Delbart name... used super-ventriloquism to make it seem like people were talking to him... then stayed at Delbart's apartment, knowing they were out of town for a few days. Last thing we see is Dr. Vandt knocking on Chris Delbart's door... and learning that the "real" Chris is an older lady named Christine. Wonk wonk wonnnk. Our back-up story is... oi, Mxy. An alarm goes off at the Fortress of Solitude... the Diary Room to be more precise. 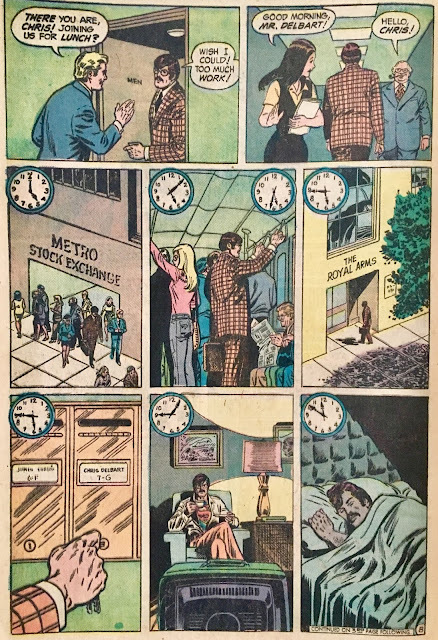 Instead of his regular entry, he finds a message from the 5th Dimension. 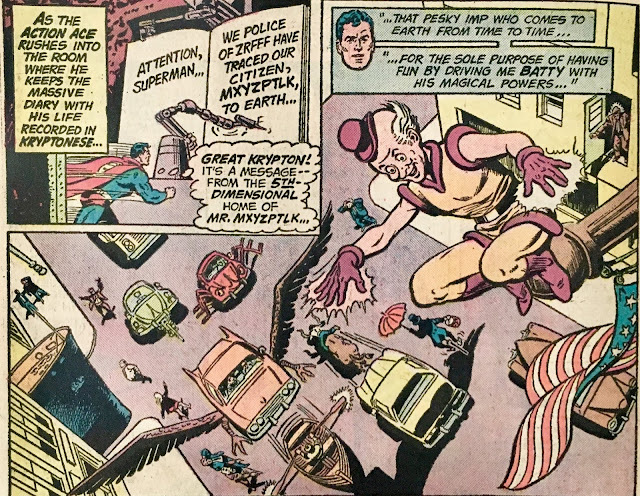 It seems Citizen Mxyzptlk has gone missing... last known whereabouts: Earth! I mean, what else is new? Does he ever go anywhere else? While Superman mulls, a news feed kicks on... it seems all of the statues in Washington, D.C. have come to life. Well, that narrows down the search quite a bit, I'd say. Superman arrives... and wouldn'tcha know it, Washington is a madhouse... more so than usual, of course. Superman tries to reason with the Imp... but, that never works. Mxy then sets his sights on the Lincoln Memorial, and brings the Honest One to life. 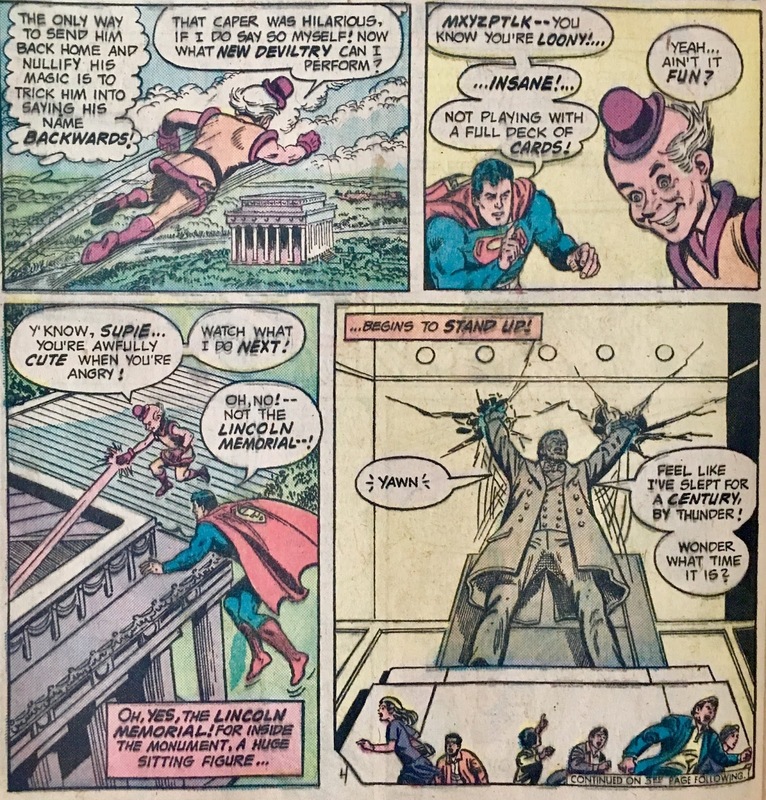 When Mxy asks why anyone thought Lincoln was so great, Superman sees his opportunity to send the Imp back. He has Mxy read the inscription on the monument... after altering it, of course. 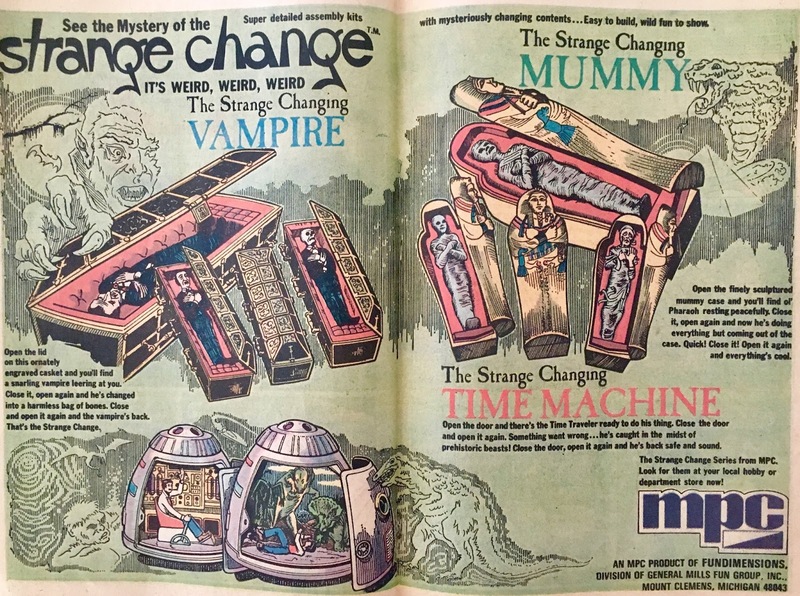 Mxy says da magic woid, and if sent away for six and seven-eighths time cycles. 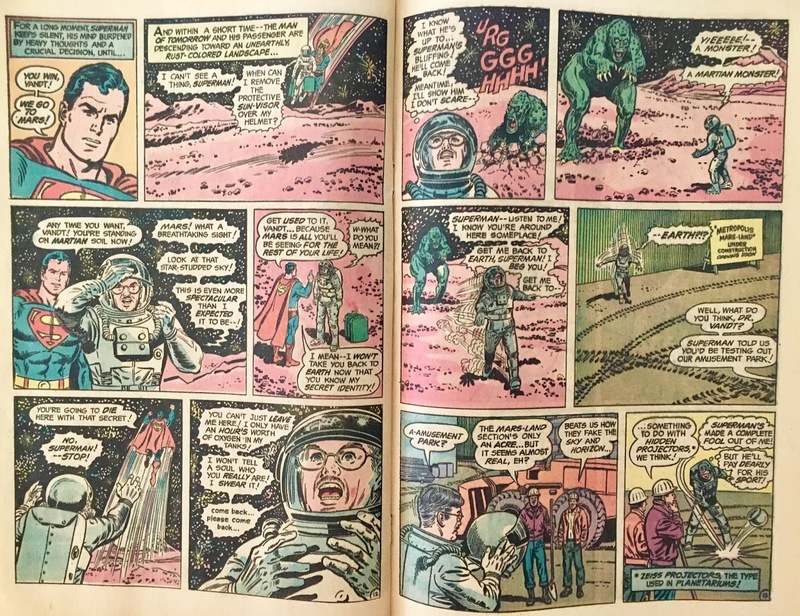 These crazy old Bronze Age Superman books are the perfect cure for burnout! It's weird... there's definitely a different "feeling" if you compare Action Comics and Superman from the 70's. I feel like with Superman, they can let their hair down... be a bit sillier. And lemme tell ya, sometimes "silly" is just what the doctor ordered. 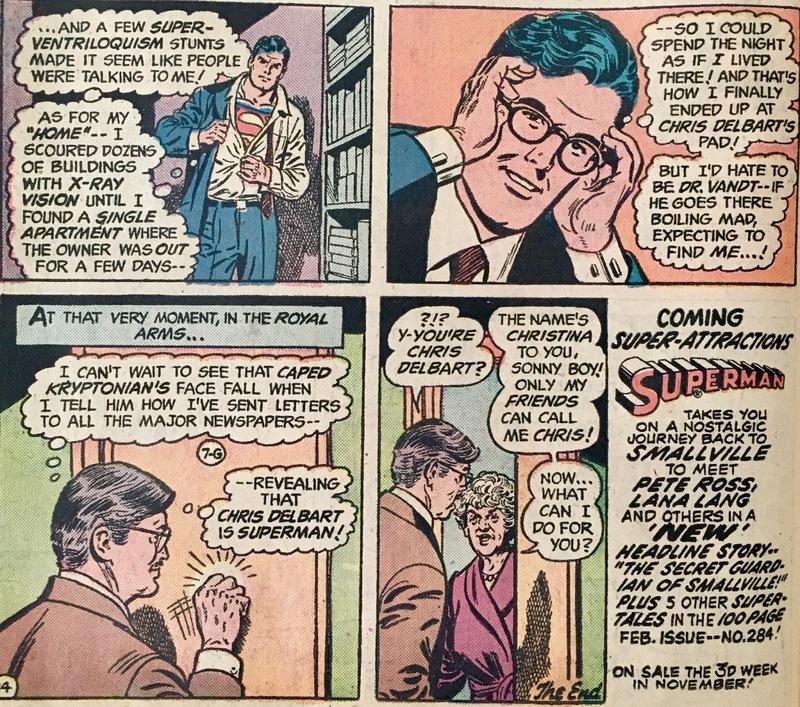 What we have here is yet another story with Superman's secret identity being jeopardized (at least in theory). 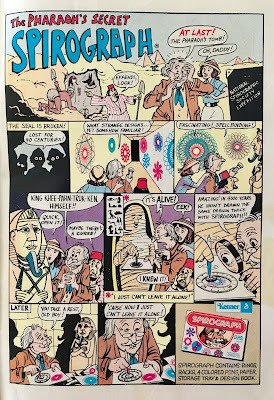 It's crazy how the secret often trumped actual crises during the Bronze Age... at least that's how it seems, anyway! Feels like every other Bronze book we look at has a central theme of "protecting the identity". 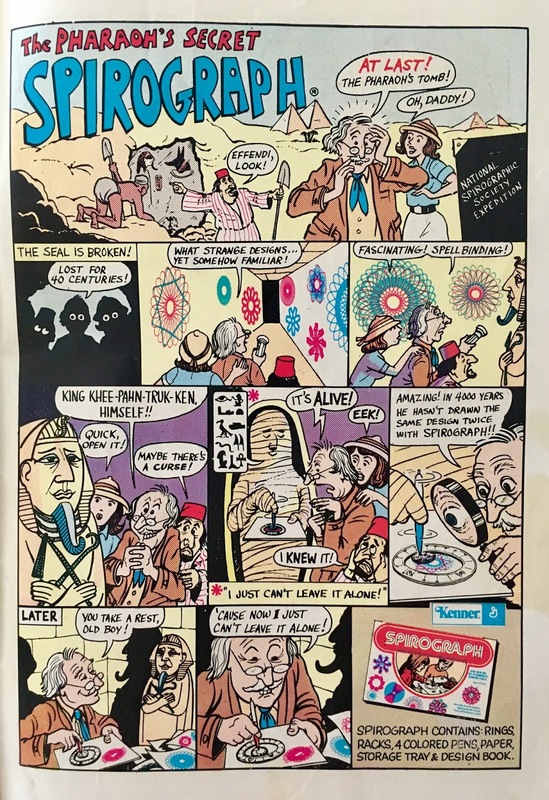 With this issue, it gets a bit subverted. Superman pretty much gives it away... via misdirection and use of "super ventriloquism", of course. It's certainly a clever way to go about it... if ya squint. All joking aside, I cannot deny that I had a lot of fun with this. 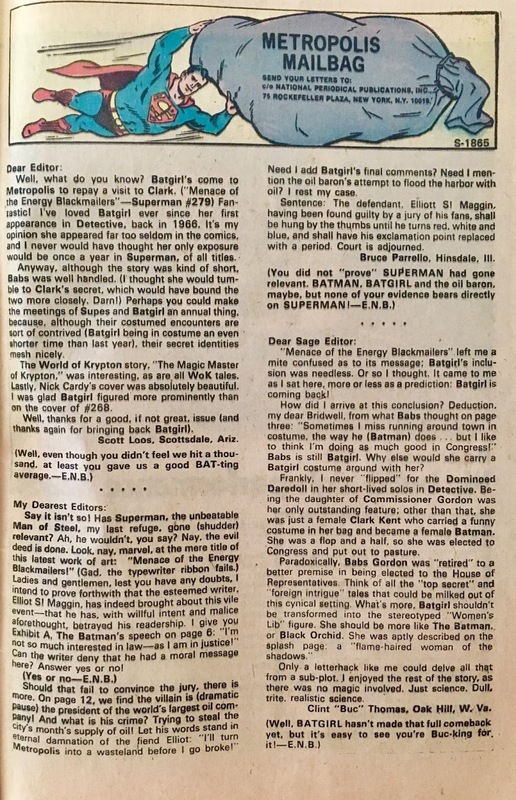 Could you imagine if they put out an issue like this today? People wouldn't have the foggiest idea what to think. Love the Chris Delbart identity too... it might be the 'stache, but he just looks so sleazy. Like he should be making shady deals with Matches Malone or something. 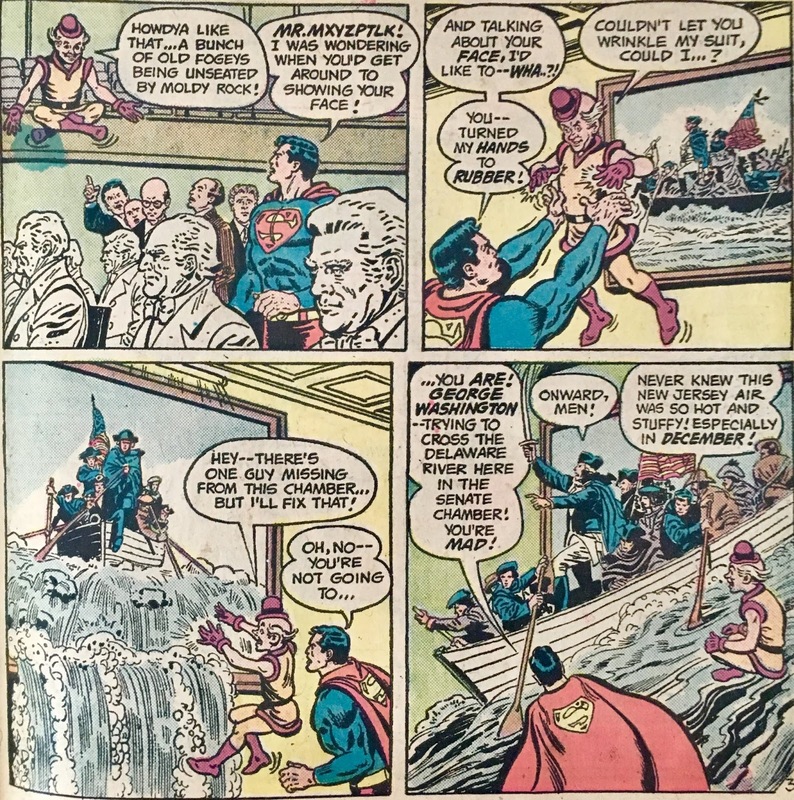 Hell, there's an issue of World's Finest we never got! For the back-up... ehh, it's a Mxy story. Wackiness ensues... then he gets tricked... rinse and repeat. Nothing new, but some really fun visuals. Overall, I'd say this fun little story is definitely worth your time. 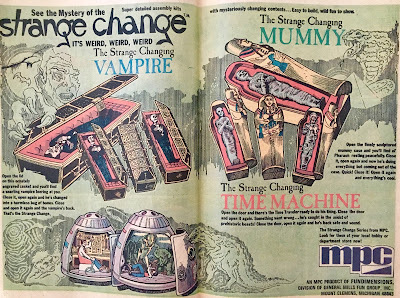 Unfortunately it doesn't appear to have been collected... nor (somewhat surprisingly) it has not yet been made available digitally. I mean, I'm not a "movie guy"... but didn't we just recently get a movie called The Wolf of Wall Street? Ya'd figure DC would throw this up digitally, even just for the gag! Single issue shouldn't break the bank... the silliness within is worth the hunt!